Note: This is a really long post, please have patience for the pictures to load. If you have not read the first two parts please click here. The Gavi incidence is rare but not unusual. I have run into these gentle giants on my woodcrawling and on more then one occasion, been charged. All these charges have been only an assertion of who is the authority in the jungle, never with any intention to hurt or kill. Just take a look at this video recorded just under a month ago. It gives you an idea how much damage an elephant can do even if the intention was not to kill! 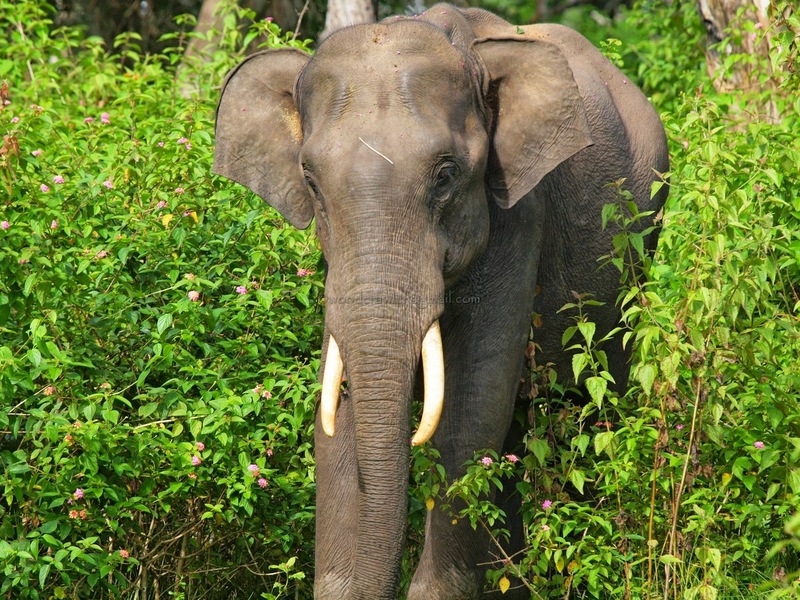 Elephants, as a rule, are placid creatures. If a day had 48 hours they'd love nothing more than just crunching on some juicy bark or tearing off tender grass and stuffing them inside their cavernous mouths. They spend 80% of their life feeding. 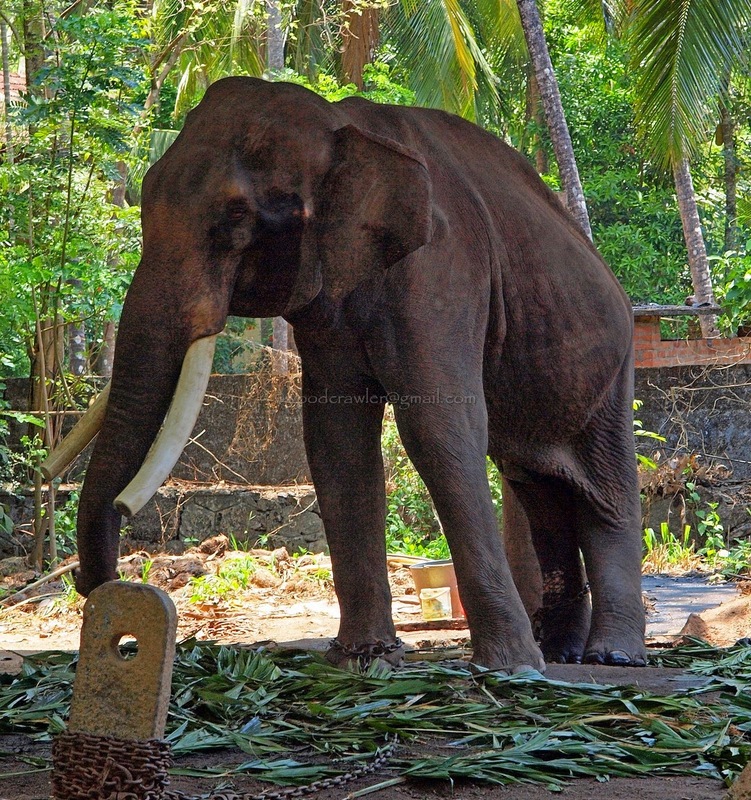 They consume about 150 kilograms of vegetation and drink upto 100 liters of water everyday. Not very surprising, considering that a full grown elephant can weigh as much as 3000 - 5000 kgs! Their shrinking habitats have now ensured that large herds have to be on the move constantly looking for fresh feeding grounds. This brings them into direct conflict with man. We humans are unreasonable creatures. 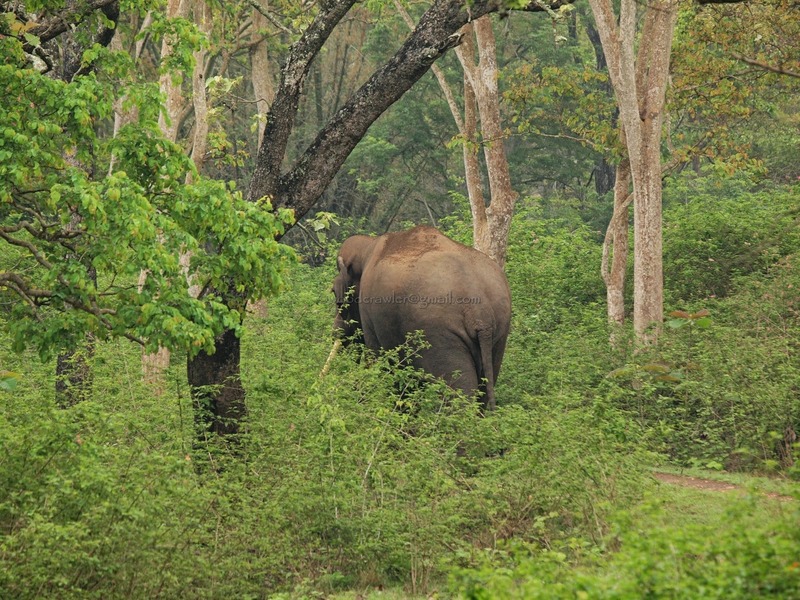 After encroaching and destroying the elephant's territory we block their movements by building roads and settlements, after which we go about converting vast tracts of forest into agricultural lands! Then, we expect these gentle creatures to understand our superiority and avoid the areas we have usurped from them! Why, then, do these gentle giants turn killers sometimes? I quote from Vivek Menon's book 'Tusker'. 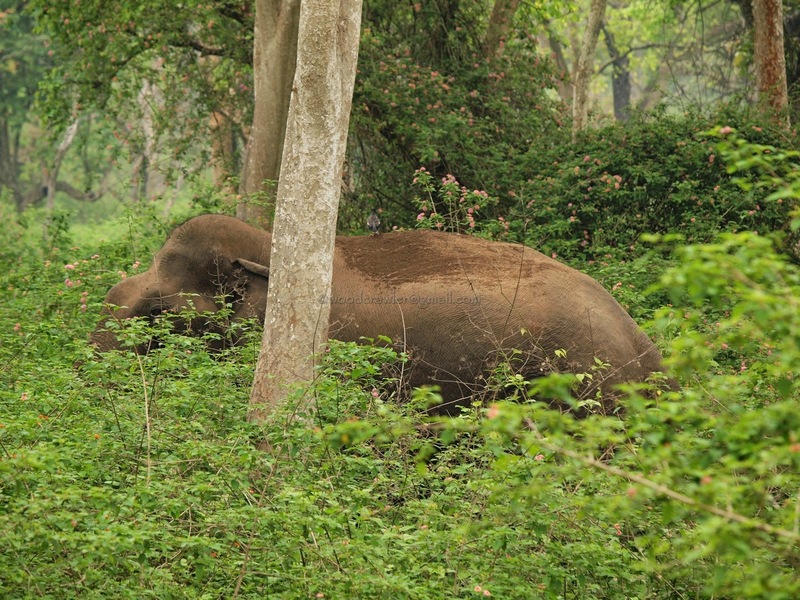 "A large number of elephants captured in Kodagu district and near Bandipur had multiple bullet wounds on them, caused by .12 bore and .22 bore shots sprayed on them by resisting farmers. In adjoining Kerala, two elephants of the Guruvayoor temple had bullet wounds with small lead pellets when the temple acquired them". 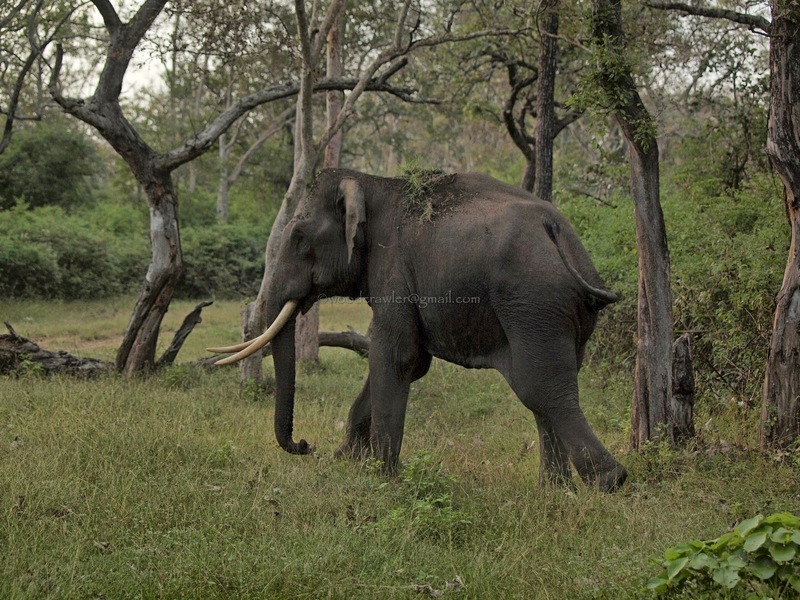 Further, he also writes, "In Wayanad, Kerala, a large tusker was captured in 1995 because of crop raiding problems. It had over 25 bullet wounds on various parts of its body". No wonder some elephants, especially those that live near human habitations or come into contact with humans, behave aggressively. They are simply being defensive. This is not meant to be a treatise on elephant behaviour but I though a small introduction will give you an idea why we should not take these creatures lightly. 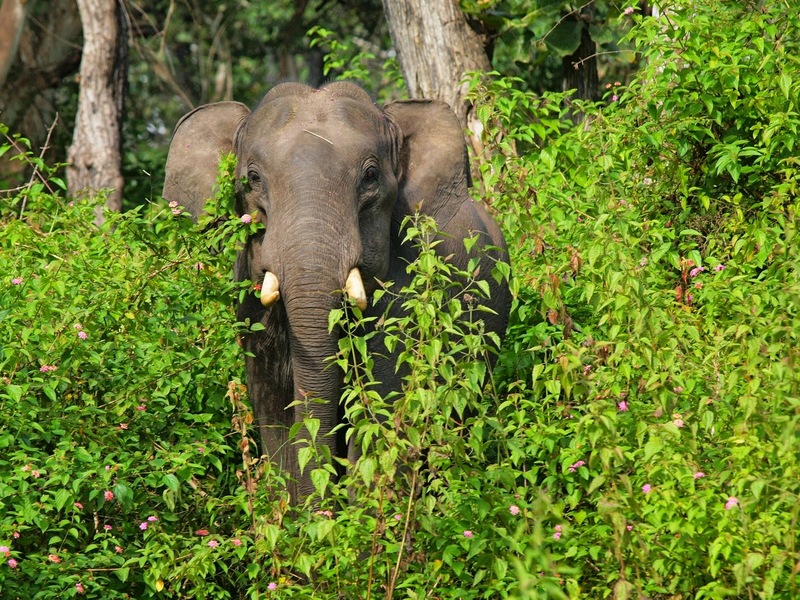 The versatile trunk of an elephant is the best smelling organ of all animals. It is five times more sensitive than the humans. 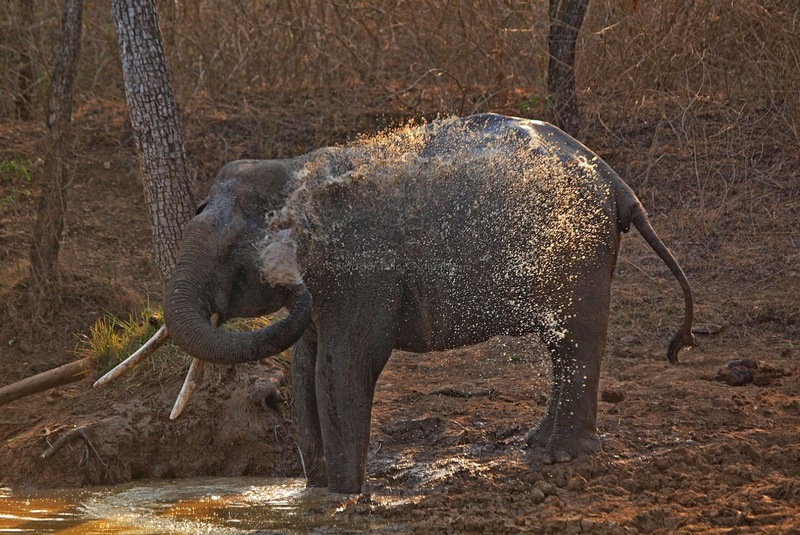 It is so powerful that the African elephant can smell water 12 kilometers away! 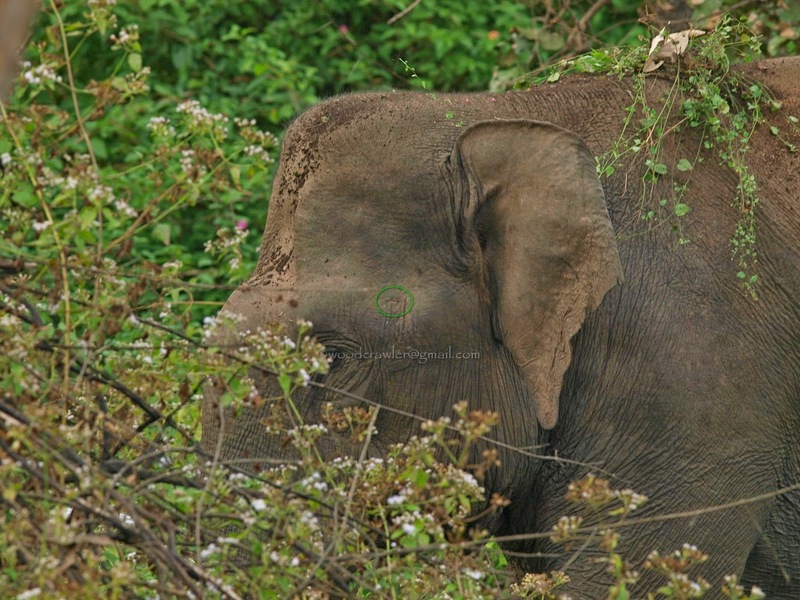 (More about the fascinating trunk here.) The elephant keeps feeling the air every now and then with the trunk. 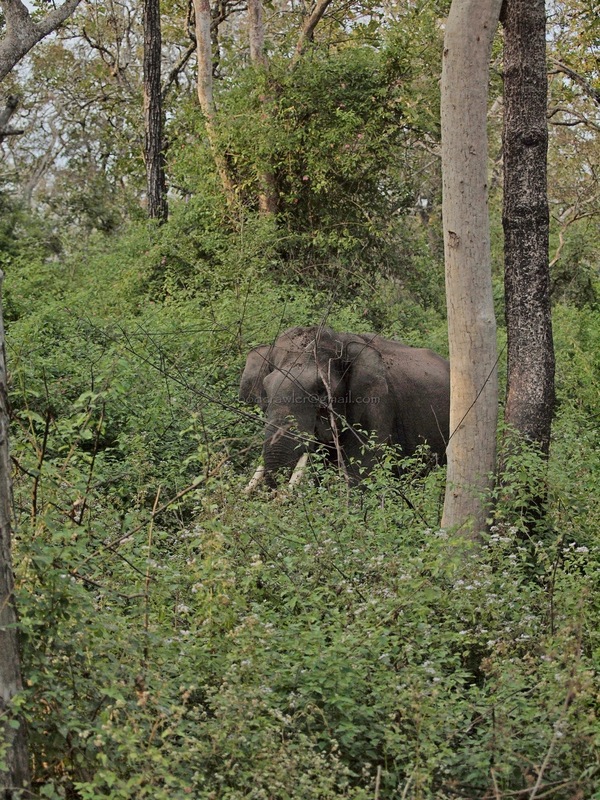 When you are in the forest especially on foot you can smell the elephant's presence easily. It also means that the elephant can know you have arrived much before you. For an animal that weighs a few tonnes it moves very silently so the human ear or nose is incapable of detecting it before it has detected you. The strategy is to always be downwind of the elephant. It means that the wind should blow from the elephant towards you and not the other way around. 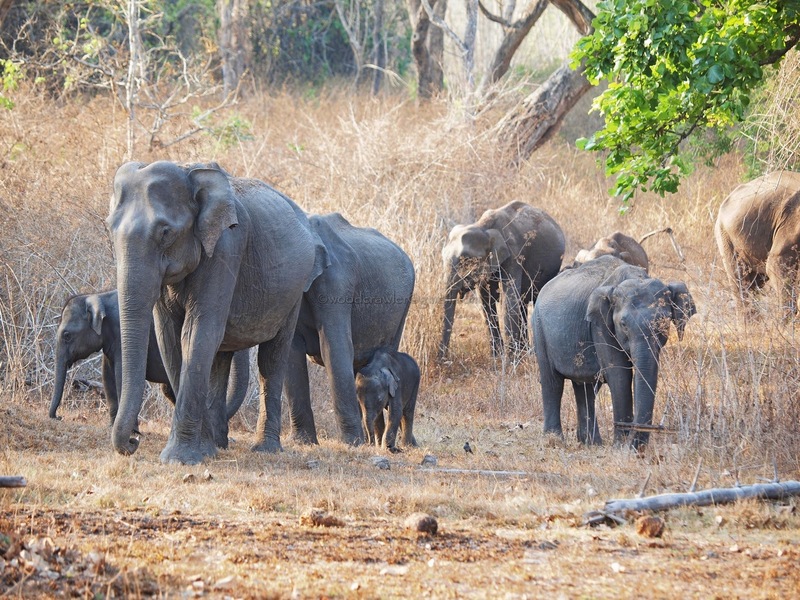 Most often elephants go about their business of eating and caring for the young very quietly. On occasions they show an aggression that is expected from an animal of that size. If you know a little bit about how elephants display their aggression you can judge if the animal you encountered is really a threat to you. 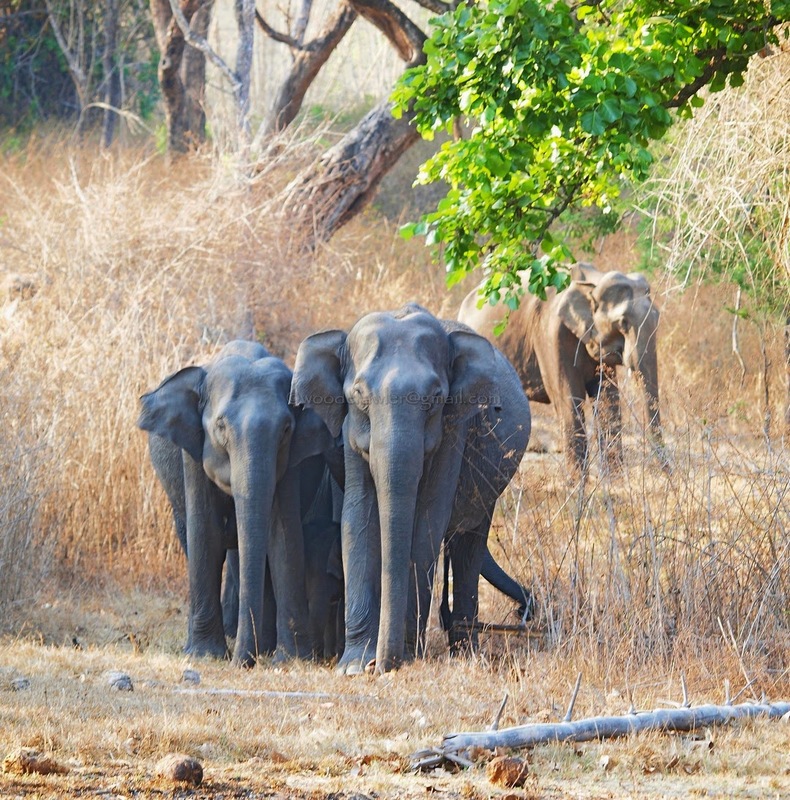 Elephants, as I mentioned before are generally peaceful animals. Females show aggressive intent when the herd has very young calves. 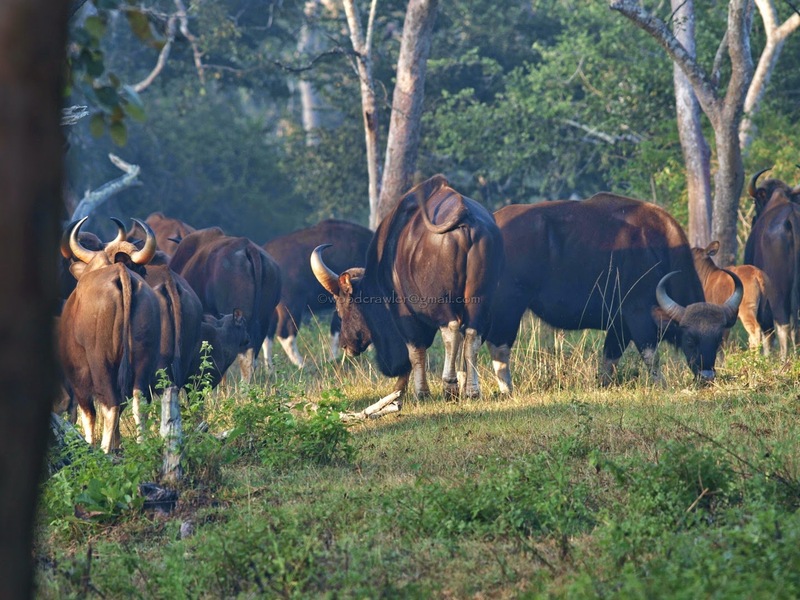 Bulls are solitary and become extraordinarily aggressive when in musth. 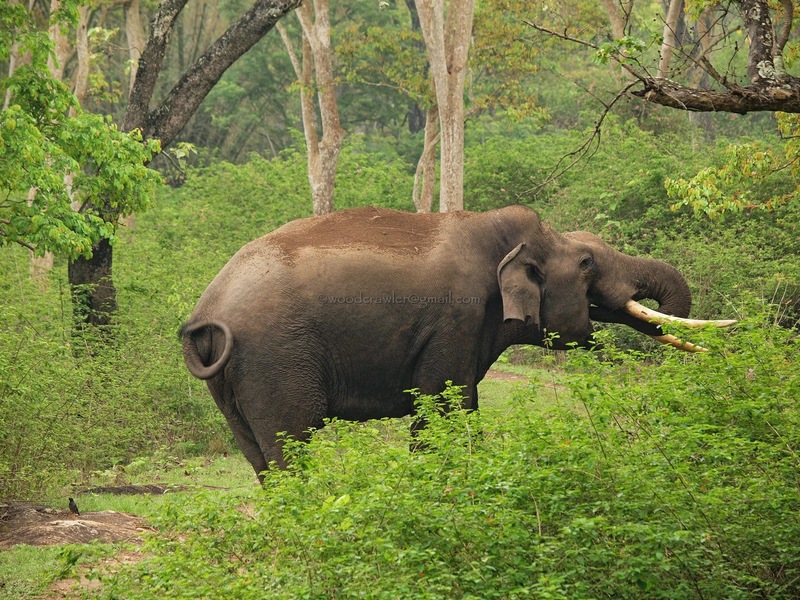 All elephants are aggressive when they are harassed, injured or sick. 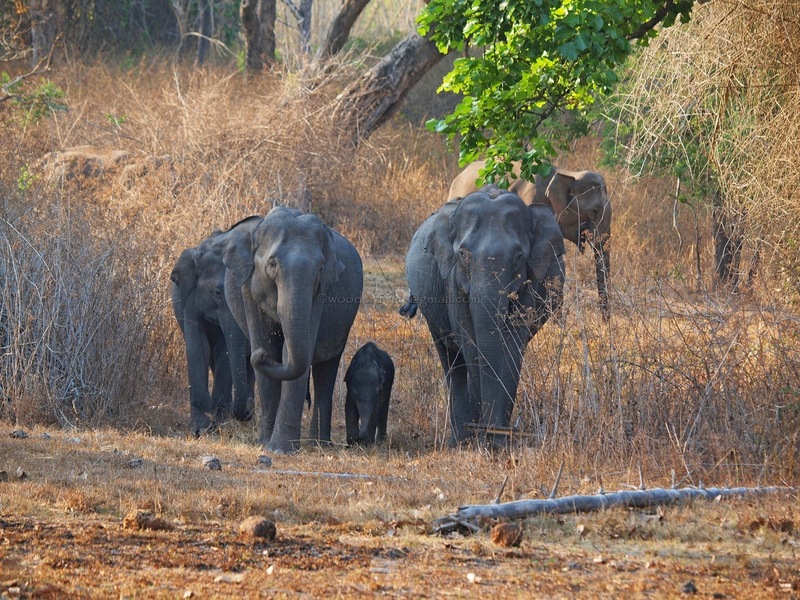 Reaction to threats by the elephants differ. Most often they put on a dominance display to scare of the intruders by raising their heads and tusks with the ears pushed forward to appear larger than they are. This maybe accompanied by much shaking of the head swishing of the trunk. This young bull was about to cross the track when we surprised it. ...... and so, retreated into the lantana again! The other reaction is the charge. They are most often they are mock charges and are broken off before any actual contact is made. The intention is to drive of the threat with a display of aggression. 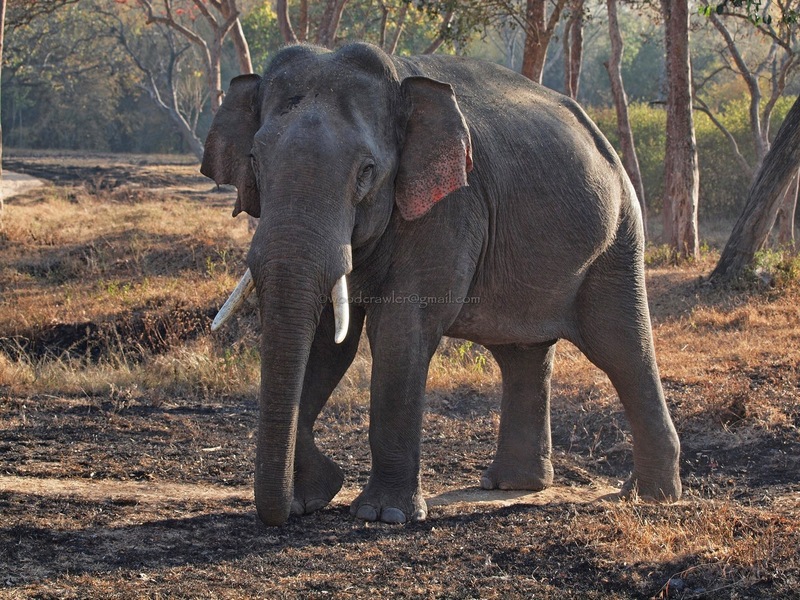 Female elephants are more prone to give you the charge. In the presence of a herd with small calves you are better off keeping a safe distance. The matriarch is very protective and will charge without any provocation. Once the threat has been dealt with the herd forms a protective ring of adults and sub-adults around the calves. ... but the smallest calves are led away from danger by the mothers with gentle nudges and pushes! Sometimes the herd itself moves away if they are not comfortable in the situation. Occasionally the mock charge can become converted to a real life threatening charge. This video was recorded in Kruger National Park on 15th January, 2015. It was being streamed LIVE! 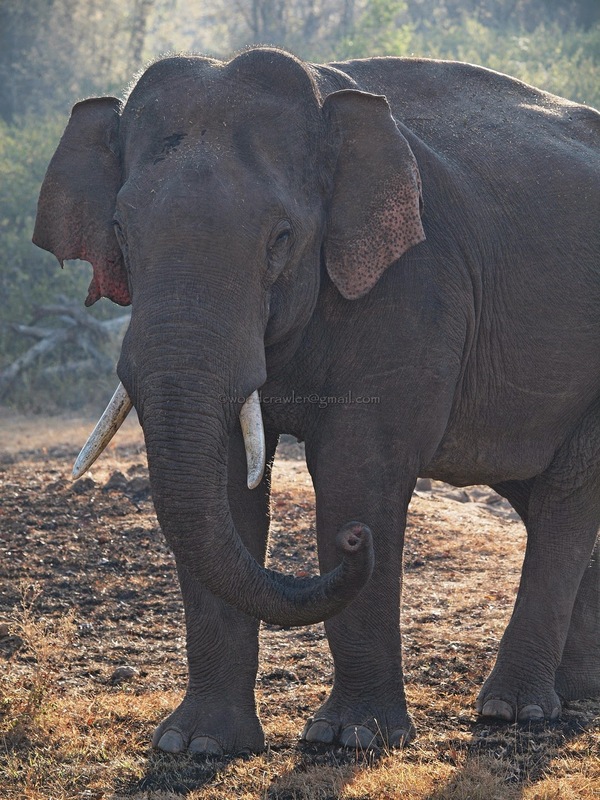 You can see how incredibly strong even the small tusks of the female African elephant is. Imagine how much damage a full grown bull can do if it decides to really handle the threat! When you happen to encounter a solitary bull in the wild leave him alone. 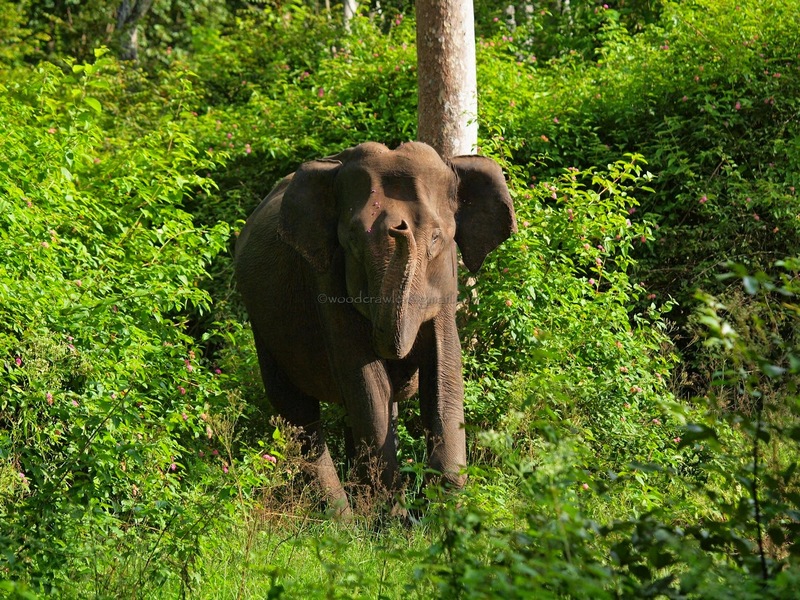 They are much maligned because they are solitary (termed 'ottyaan' or single one in Malayalam) and very unpredictable when they are in musth. Every solitary bull is viewed as a trouble maker though in actual fact, they are not. 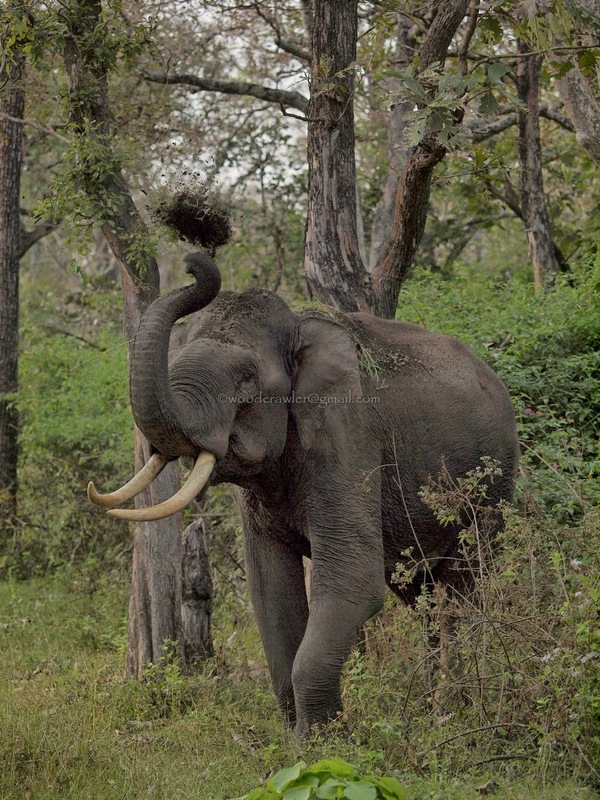 Solitary males in musth are best avoided at all cost. 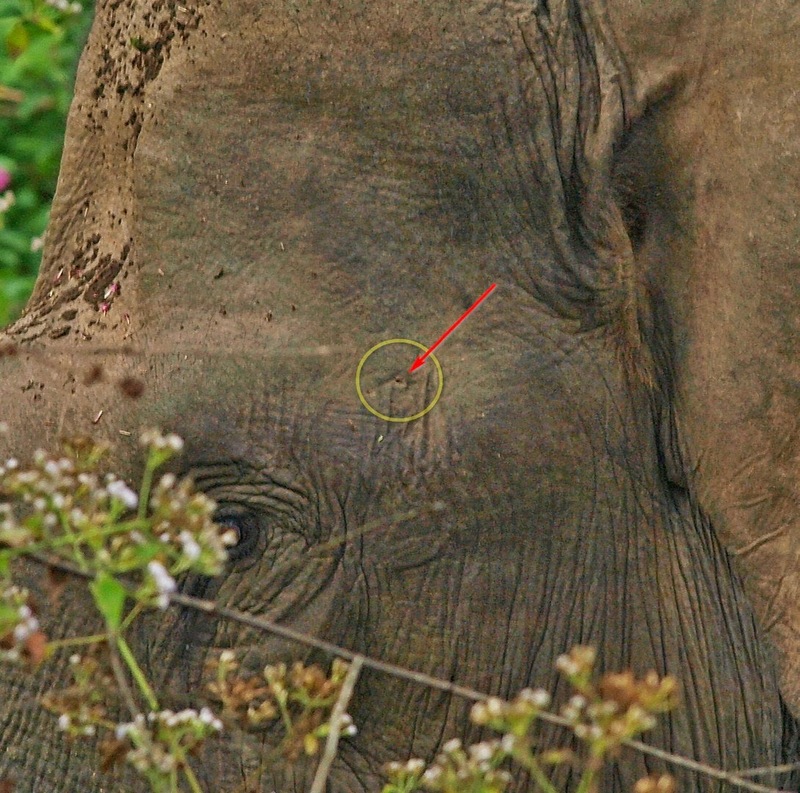 The opening of the musth gland can be seen inside the green circle. 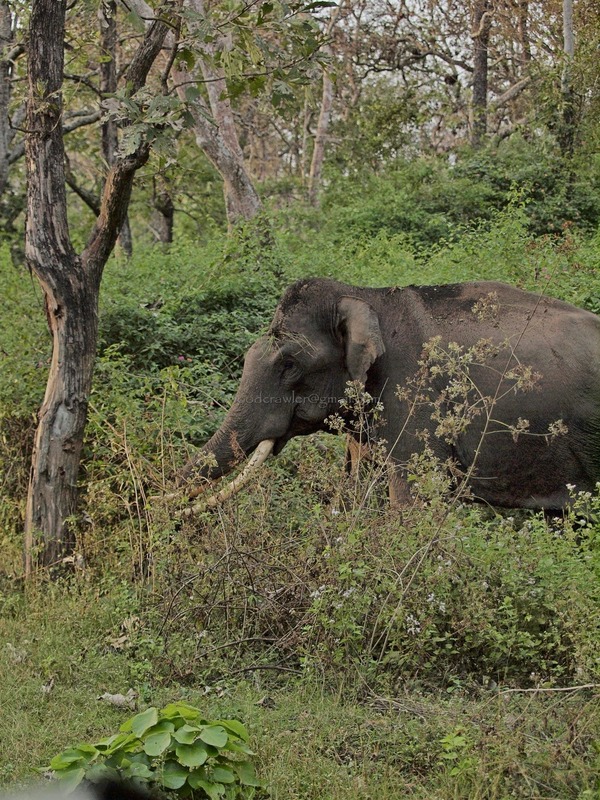 It is not difficult to identify a bull in musth. Look for the opening of the gland located about halfway between the eye and the ear hole. A cropped version of the above picture. The red arrow shows the opening of the gland. 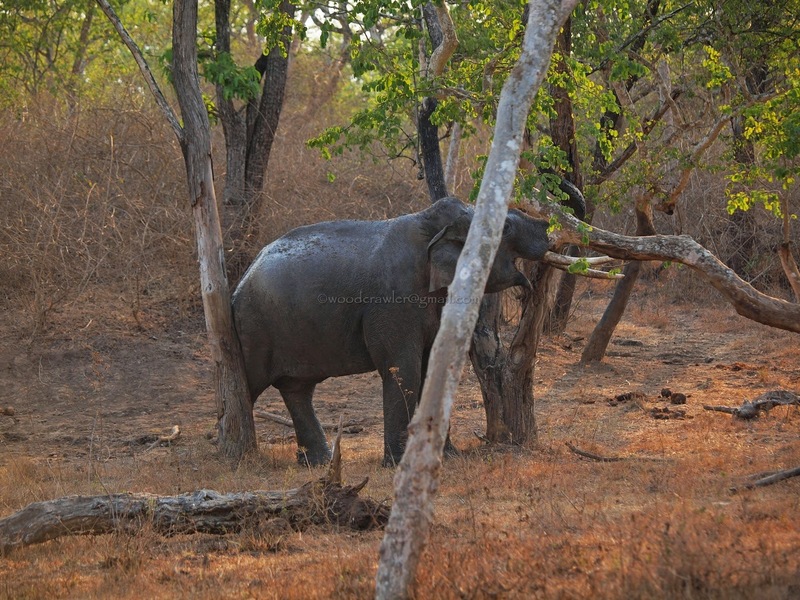 If an elephant is in musth there is a trickle of fluid from this hole towards the mouth. It leaves a very distinct wet patch of skin between the mouth and ears. 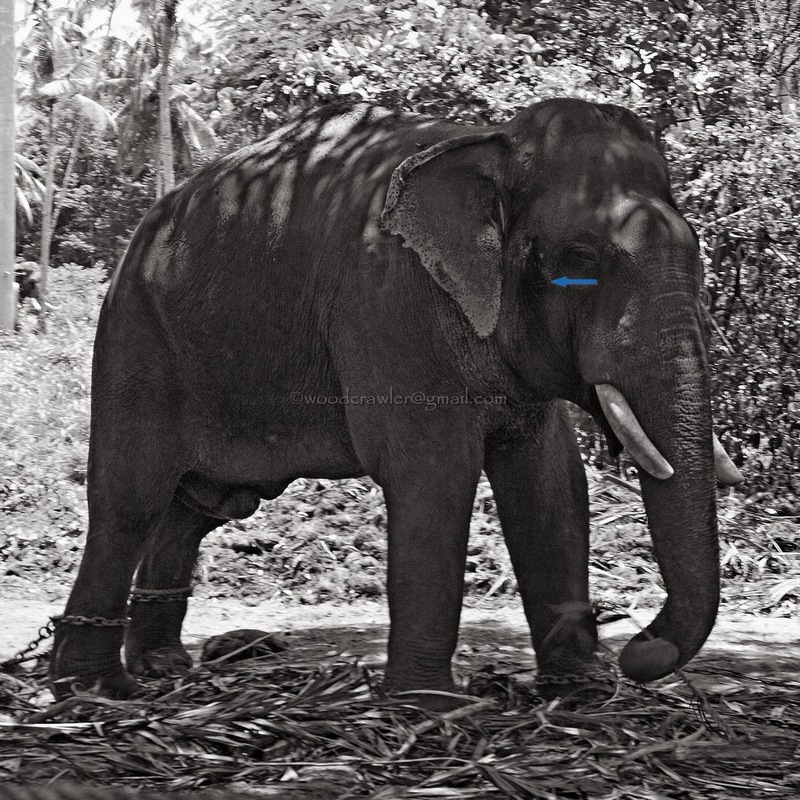 Temple elephants of Guruvayur are chained up and isolated during the cycle as they pose a danger to their handlers, other elephants and anything that they take a fancy to including vehicles and electric or telephone posts! 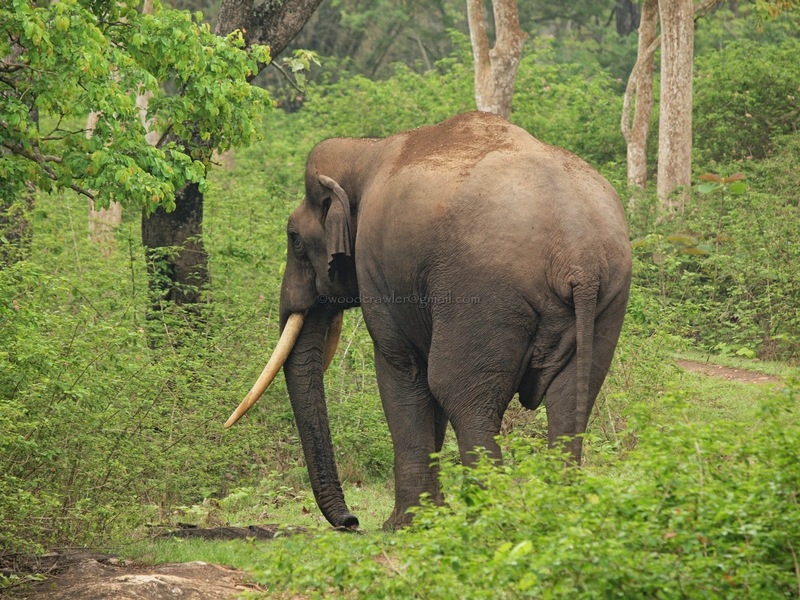 Asian elephants can attain sexual maturity by 15 years but the musth period is not intense till they are 20-25 years old. 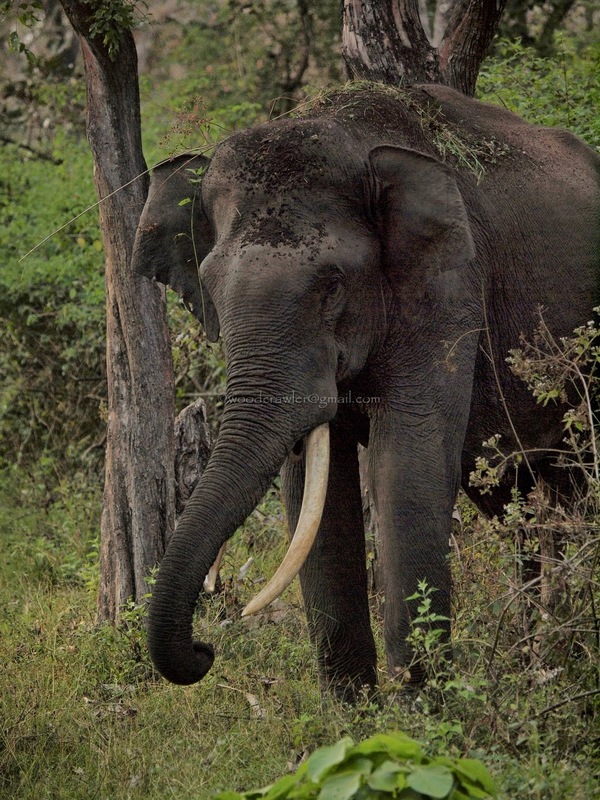 (More about musth here.) The African counterparts go into cycles about 5 years later. This old bull was estimated to be over 70 years and is one of the oldest in Punnathoor Kota, Guruvayur. It was in musth but wasn't behaving as aggressively as the younger males. 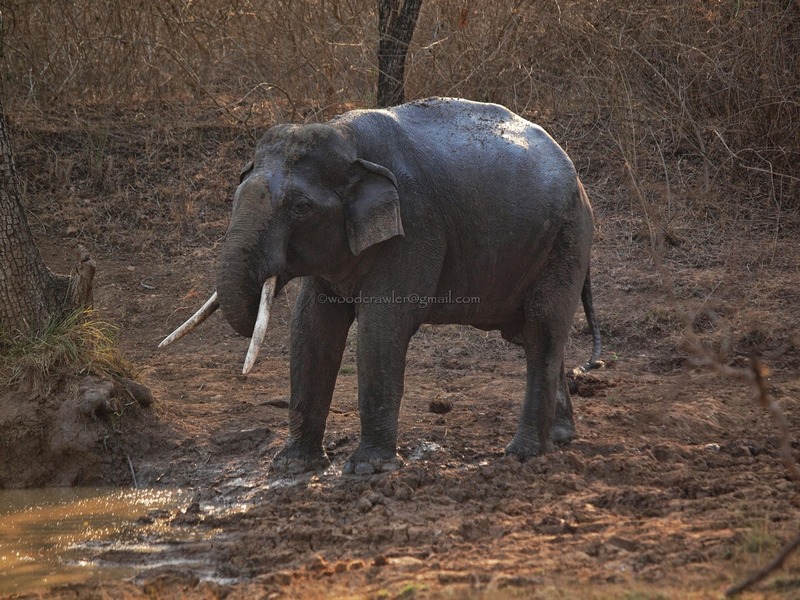 There is no clarity on the upper age for musth or if the intensity reduces over time but it lasts throughout life as observed in captive elephants. 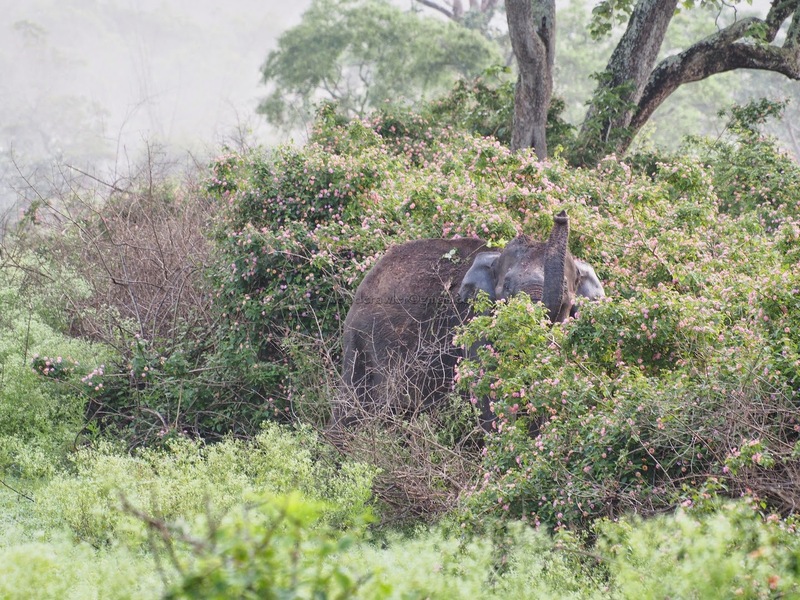 In the wild it might not be always easy to identify an elephant in musth because they tend to be hidden by the vegetation and suddenly pop out on you without warning! It has happened more than once especially after a good monsoon. 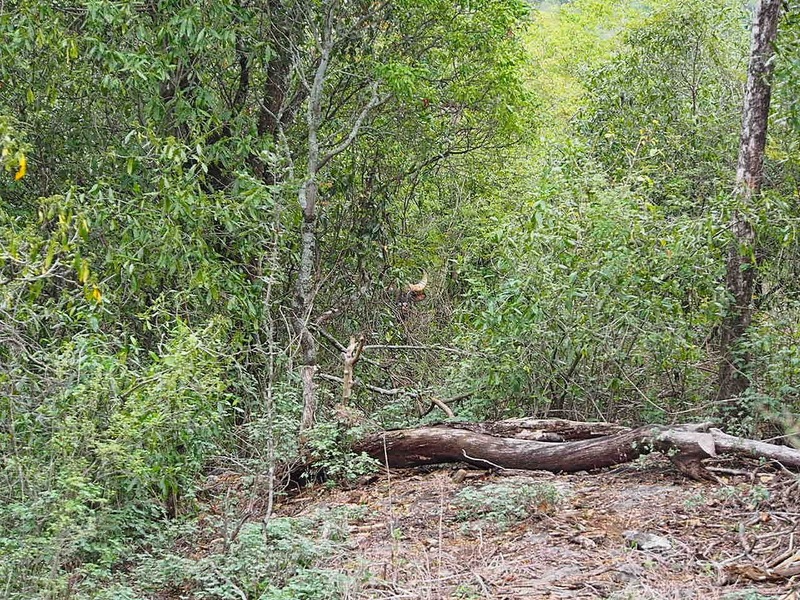 The vegetation is rich and dense. 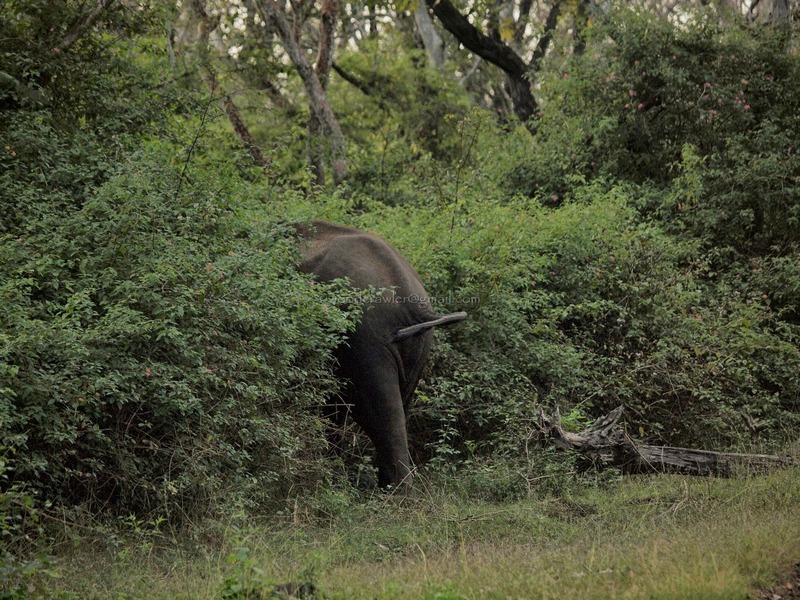 Even a very large tusker will be invisible till you almost knock into it! As we rounded a turn this large bull was feeding on the foliage on the side of the track. .......... before going off into the bush eventually. Younger and inexperienced bulls are more demonstrative and put up the dominance display more often and accompanied sometimes, by a half charge. 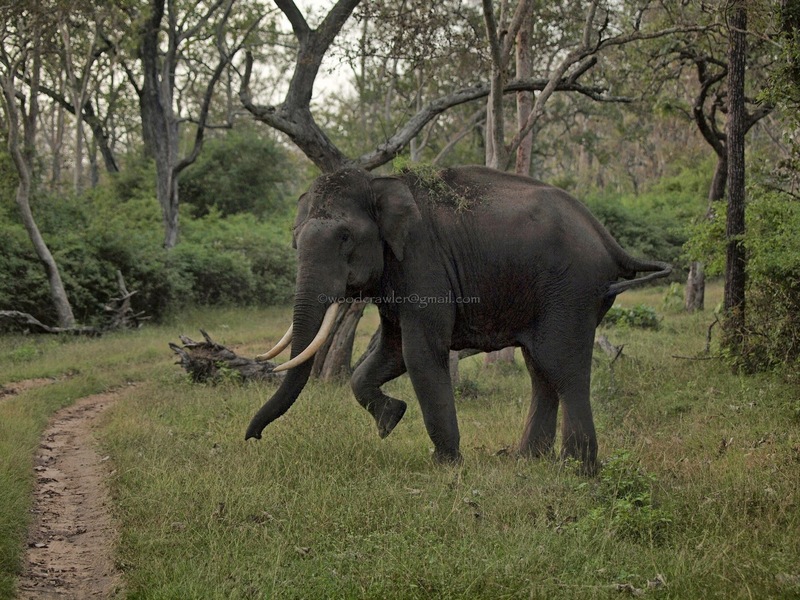 This young bull was about to cross the Campanmutti Circle in Bandipur National Park. It appeared that it had just crossed the highway from the eastern part of the park into the western part. The bull and our vehicle reached the junction almost simultaneously. It realizes that there are others waiting to cross its path. Walks forward with the trunk casually wrapped on its magnificent tusk. 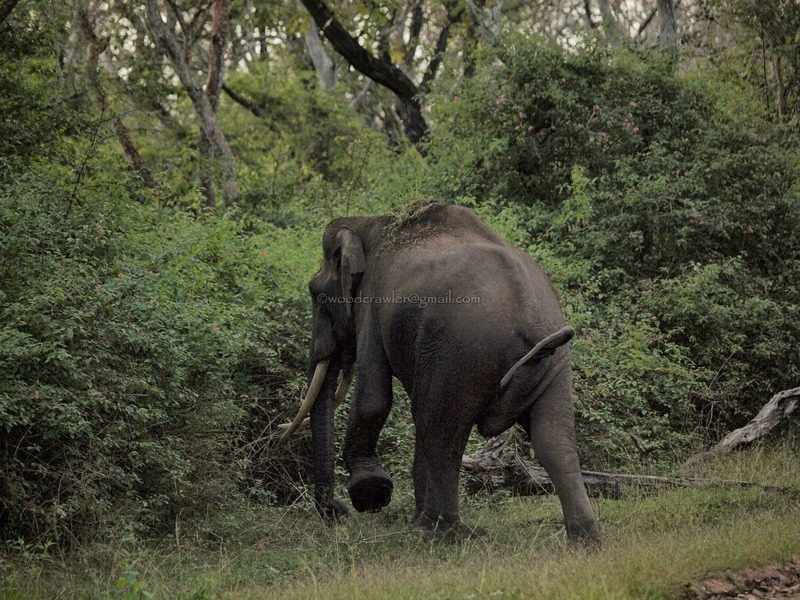 Decides to show its superiority; ears forward, trunk swishing and tail up! For good measure it threw some mud and grass onto its back. ............ and ran away squealing in protest!! ......before eventually disappearing into the lantana on the opposite side of the track! As I mentioned earlier an occasional charge can be genuinely dangerous. You have to learn to differentiate a mock charge from a real killer charge. 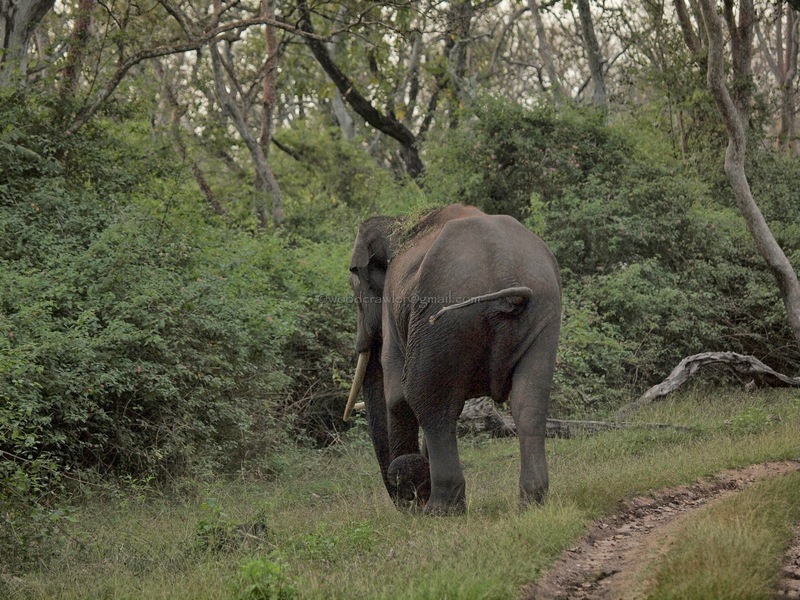 When an elephant charges there are a few signs that can forewarn you if it is going to end unhappily for you. Each elephant is a distinct individual with its own distinct behaviour therefore all of them may not behave predictably but in most instances they do. Although it may not be perfect it is useful to know these signs as they can be the difference between life and death. When it is a mock charge the elephant is more demonstrative. It trumpets, opens the ears and flap them, lifts its head and twists it from side to side. It may pluck grass or mud and throw it in your direction. If it is a mock charge you can hold your ground, that is if you really have the nerve to face up to a few tons of solid bone and muscles bearing down at you at trumpeting loudly! It might just halt as abruptly, wheel around and retreat. 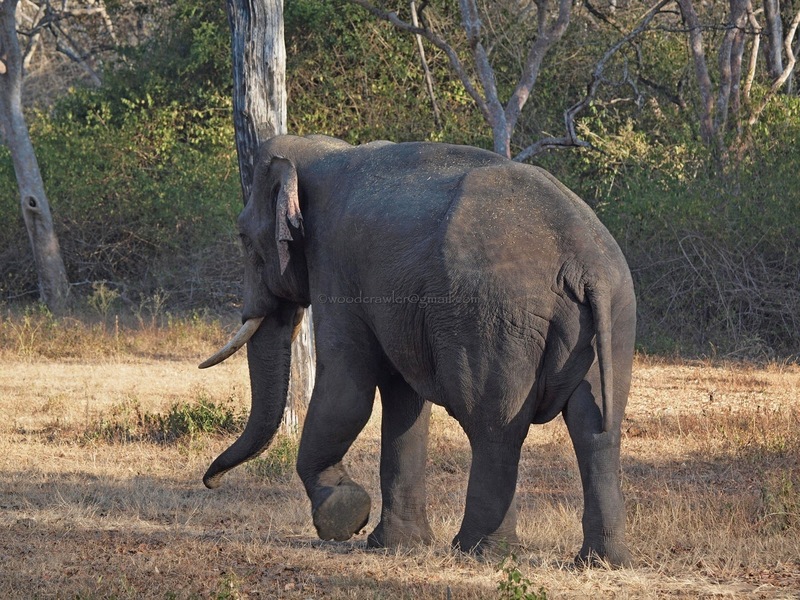 On the contrary if the charge is truly with malicious intent the animal curls up its trunk, lowers its head and charges with the ears laid back. Then it is time to take flight. The only intention the elephant has is to catch you, trample you, impale you with its tusk and probably dismember you! A very painful death is the only possible result if it gets to you. 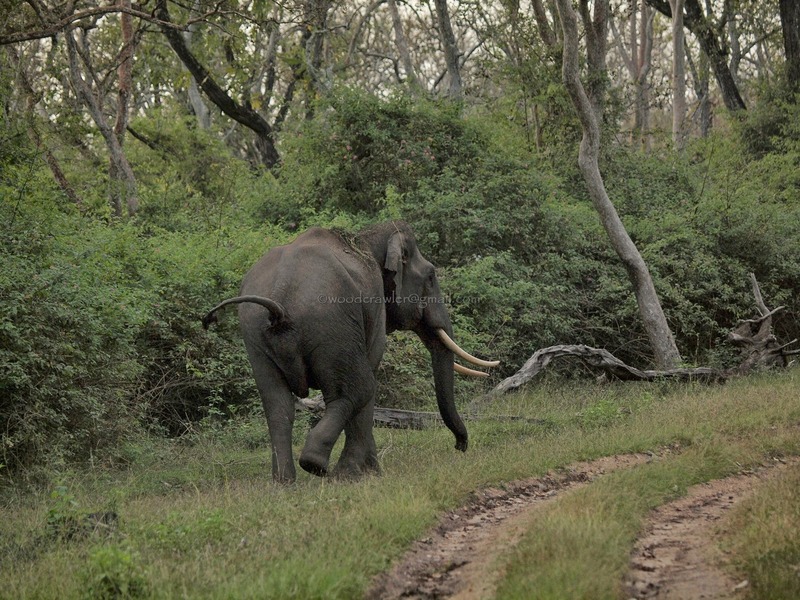 Running from an elephant is a challenging affair especially if your fitness levels are suspect and the terrain and forest favours a bigger animal. We can run at about 15-20 kmph on level ground. Usain Bolt is clocked at 37 kmph over 100 meters! 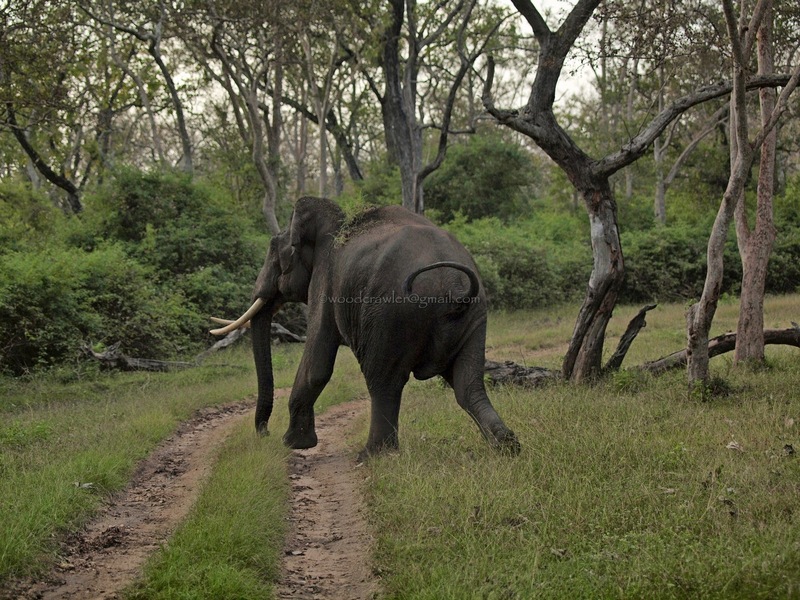 The elephant has been known to run at about 25 kmph but has been clocked at 40 kmph on one occasion! The idea is not to outrun a genuinely angry animal. Try to find something to climb onto or keep between you and the elephant. If there is a deep trench or ditch, jump in. 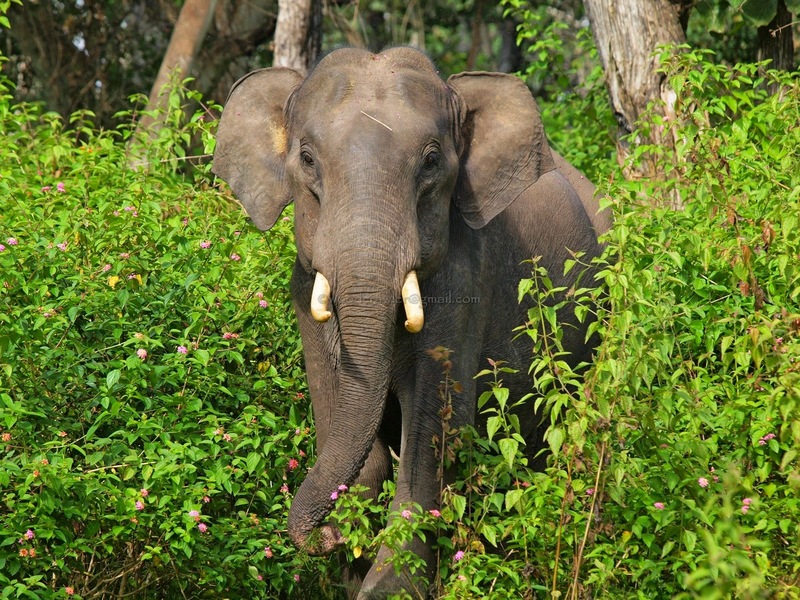 Mature bulls, unless in musth, are rarely very demonstrative. The observe you with quite dignity and once they have assessed your threat potential the simply ignore you and walk off unhurriedly. ......he crosses the track with no care in the world. "Wait till I'm gone" is the message! 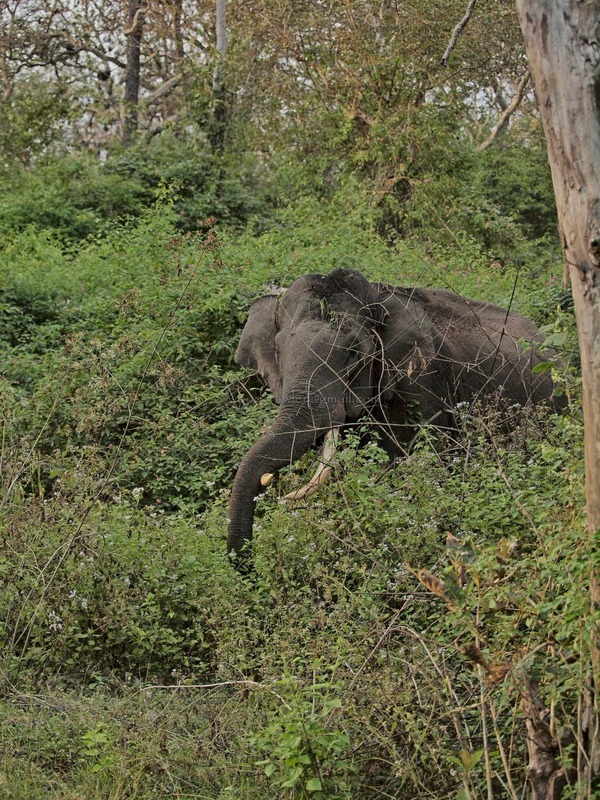 Without a backward glance the majestic tusker disappears into the jungle. Some bulls will just ignore you and get about their business. 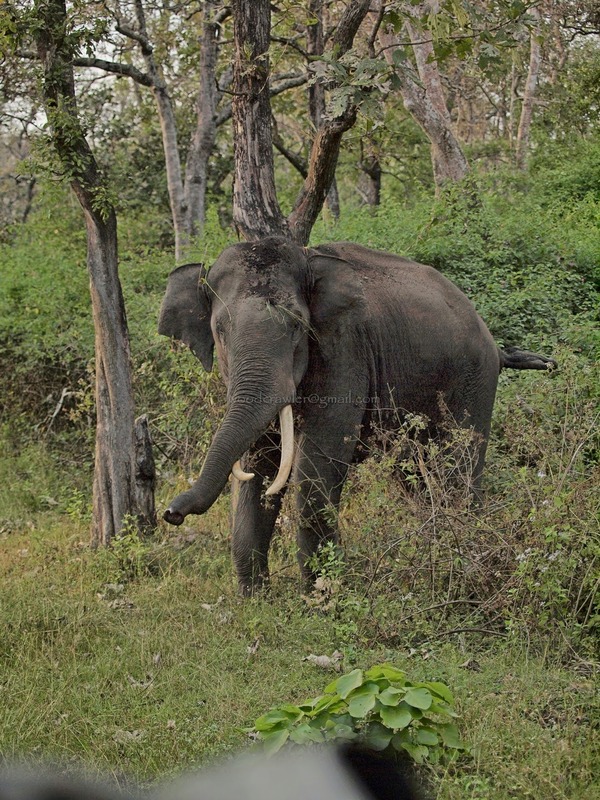 While waiting at the Subbarayankatte waterhole in Bandipur, late in the evening on a safari, this bull came down to the water, drank its fill, had a shower, then went and scratched itself on a low tree. All the while it seemed oblivious to our presence! 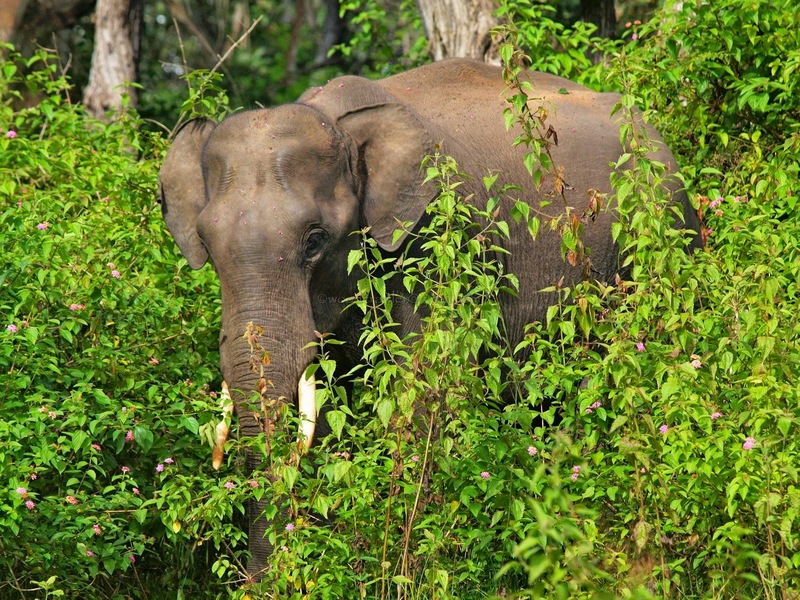 More often than not, an elephant in the wild would prefer to avoid a confrontation. 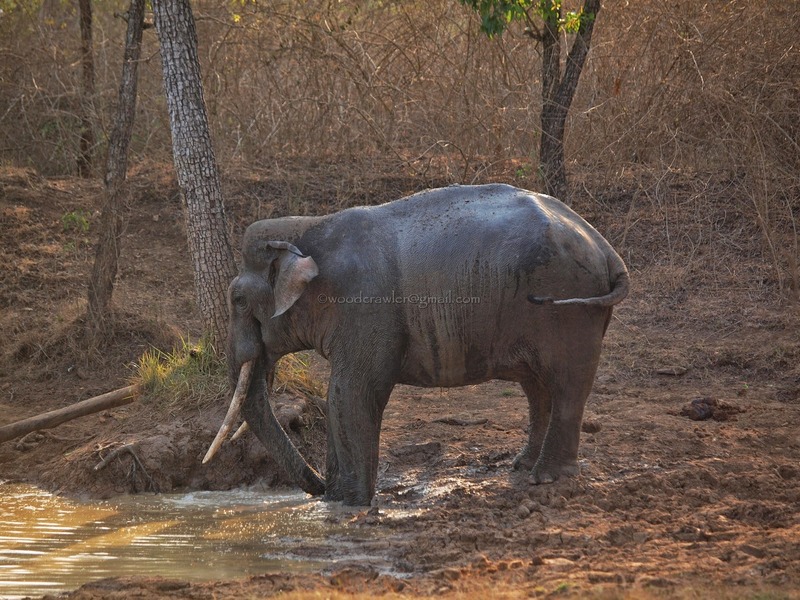 Most killing happen in areas where we humans have encroached into its territories or and places where domesticated elephants have been ill treated by drunk mahouts. 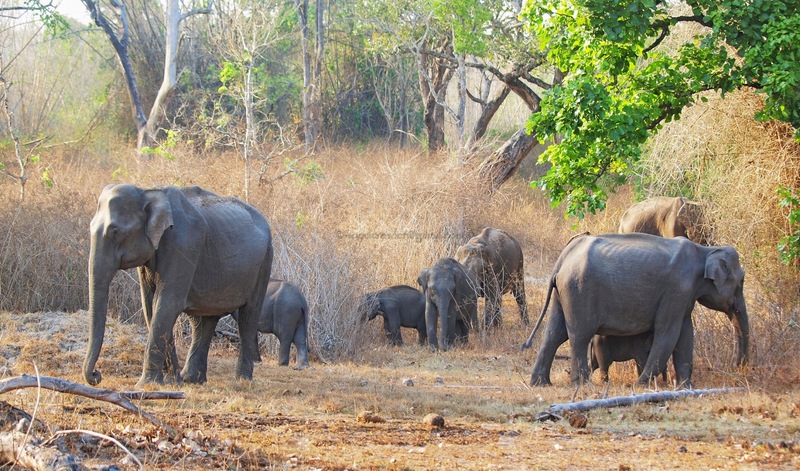 There is no need to panic in the presence of these gentle pachyderms if you adhere to the guidelines mentioned in my previous blog. 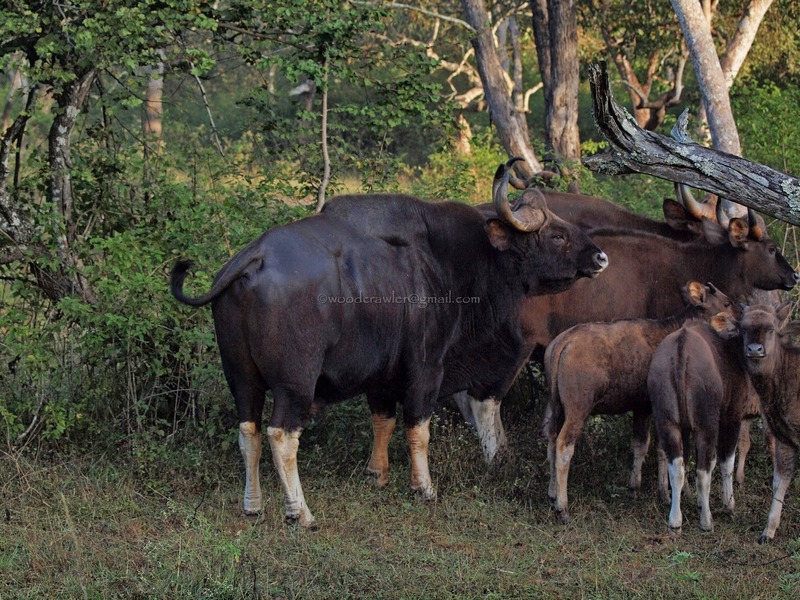 The same rules apply to the gaur, the largest wild cattle in the world. They are found in large herds and in the morning come out onto the safari track to warm up in the morning sun. They will move off at their own time and remember gaurs don't charge like elephants. When a herd stampedes, just keep out of the way. 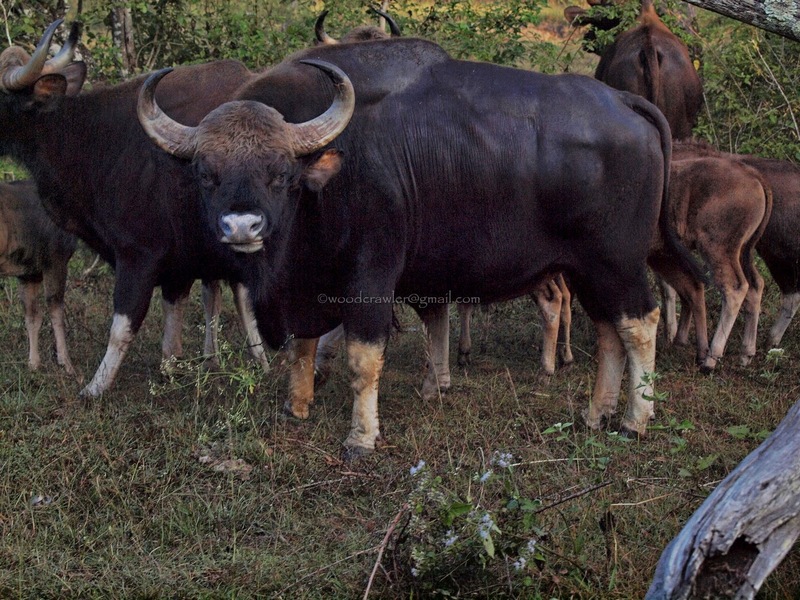 I have, on one trek in Chinnar, crossed the path of a gaur. 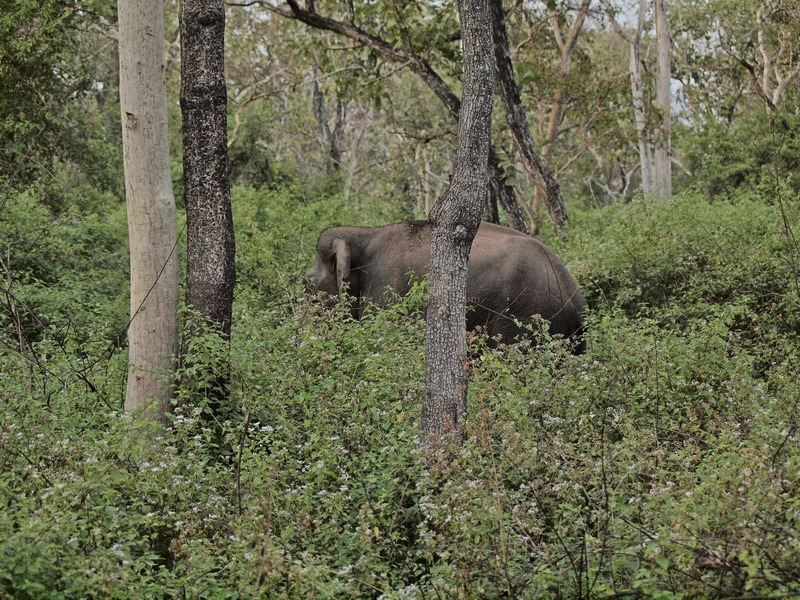 The guide and me had smelt elephant and were scouring the forest on either side of the tracks for the herd. Suddenly, out of the trees the head of a young gaur pops up! 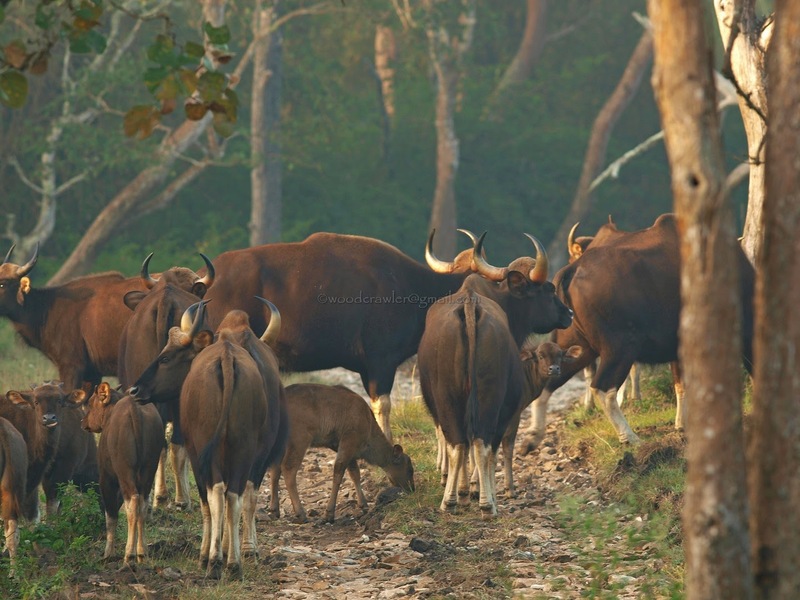 If the gaur was not right in the middle of the frame it would have been difficult to spot it in the dense vegetation! That was the first time I had taken Skanda on a real trek in the wild because he was growing up into a real Woodcrawler! I wasn't sure who was more surprised, the gaur or us! So if you are out in the wilderness, either on a vehicle or on foot, if you adhere to some simple rules you can ensure that you won't have any unhappy encounters. Stay in your vehicle at all times. 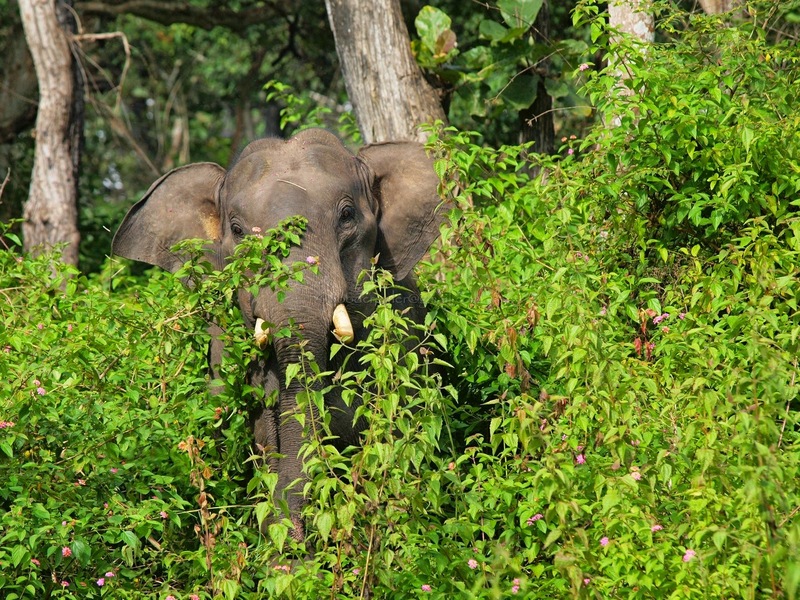 Getting out makes you an isolated target and even with poor eye sight an elephant can pick you out for showing its irritation. Start your trip after at dawn and finish it off before sunset. Don't switch off the engine and light of the vehicle. The vehicle is seen as a larger 'creature' and the people sitting inside are not perceived as separate from the vehicle. Don't drive too fast. Animals crossing suddenly maybe knocked down and killed unintentionally. Keep to the speed limits; usually 30-40 kmph. Animal crossing areas are marked with boards. Slow down and drive carefully. Don't make noise or speak excitedly. Some people have the annoying habit of trying to attract the attention of wild animals by making loud noises. Loud noises can alarm the herd. 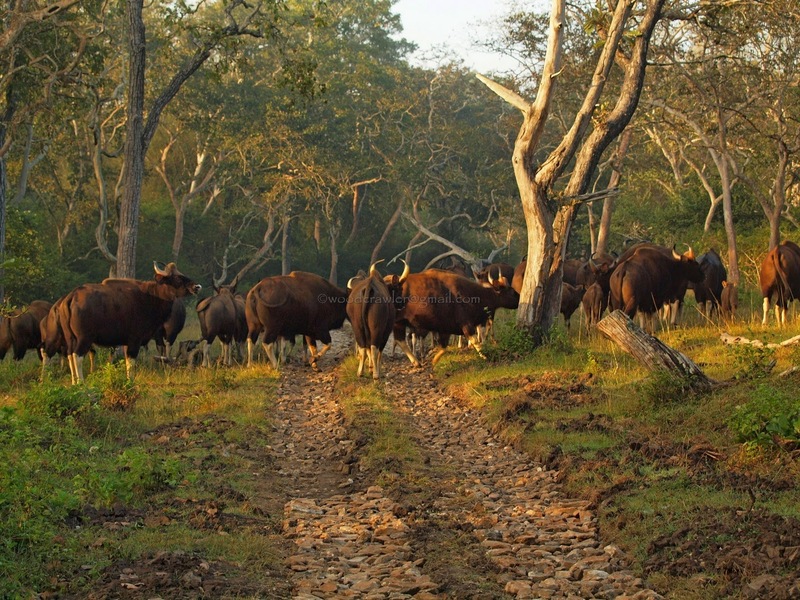 What happened in Gavi was a result of an alarmed sambar running out of forest into the herd's presence. 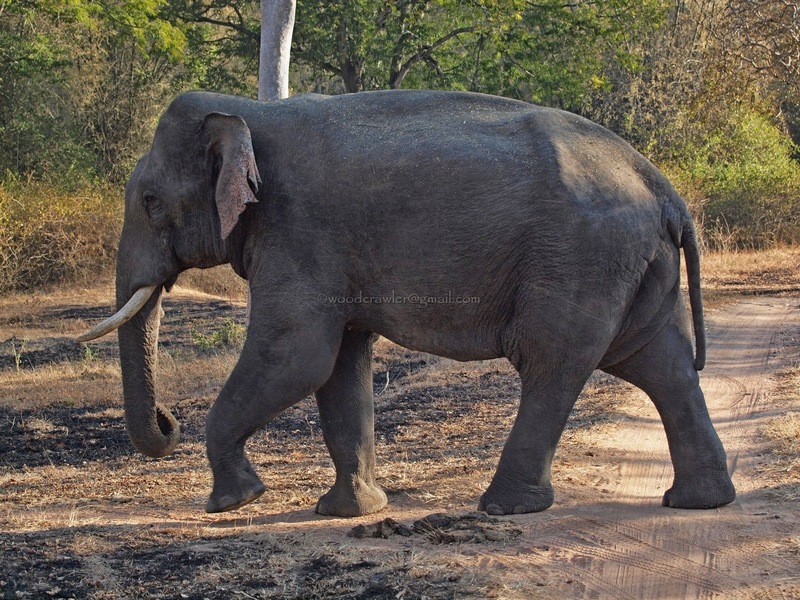 Don't attempt to get too close to an elephant. They will misread your intention as a threat and react accordingly. Photography is encouraged but keep your flash switched off. 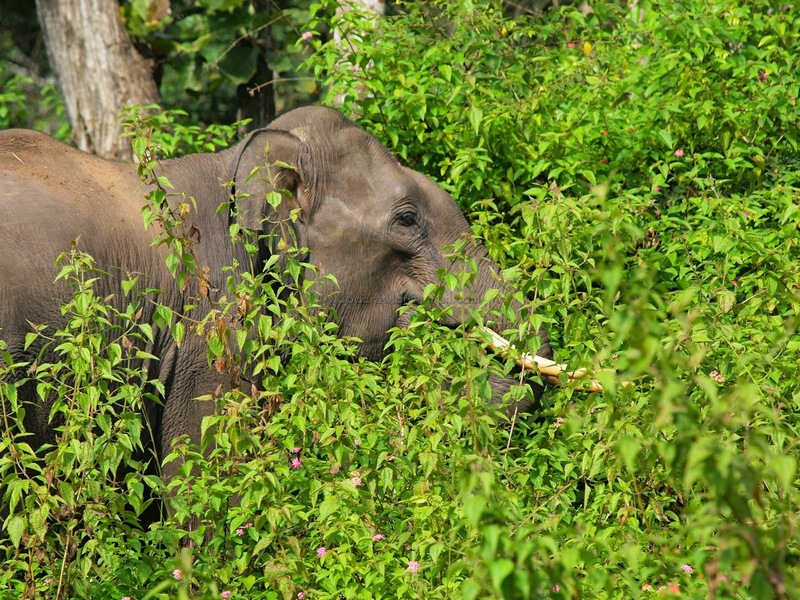 Elephants hate the sudden flashes of light. Remember, the see poorly in very bright light. If you are trekking on foot ensure that you are fit for the trip. Follow the guide's instructions and don't wander off the track. 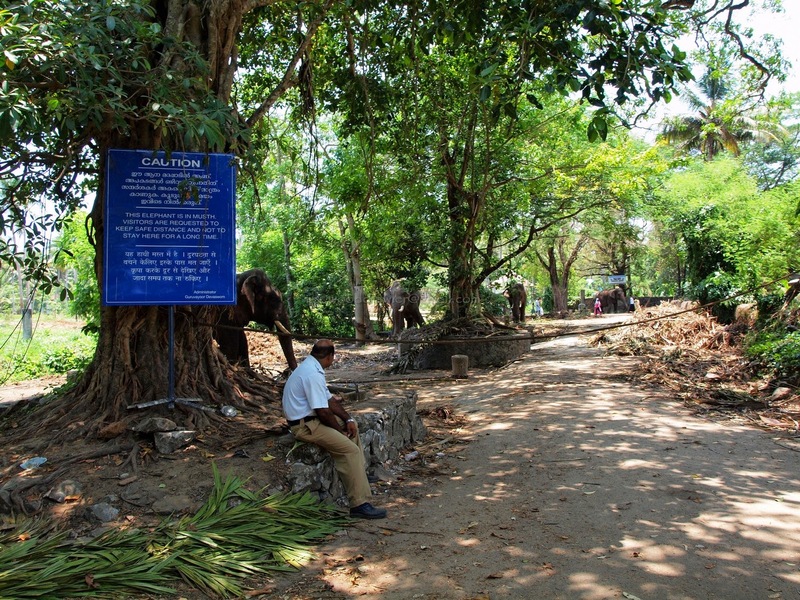 Stick to the route designated by the forest department. Ensure that the guide has instruments or avoiding attacks by wild animals. They usually carry fire crackers, a large bush knife and sticks. Some places have guides with firearms. Carry maps or handheld GPS especially while on foot. Carry water and food sufficient for the trip. Ensure you carry your litter back with you. Wear clothing and footwear suited to the place you are trekking in. Avoid loud colours and flimsy street footwear. 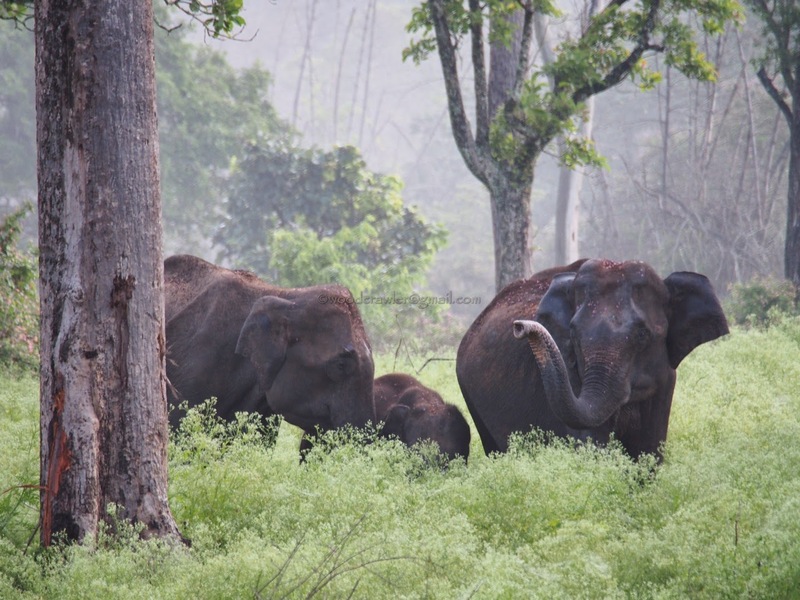 This is one of my longest posts and is a direct result of the Gavi elephant attack. I call myself a Woodcrawler and encourage others to try woodcrawling. I felt it is my responsibility to also share with you some tips for safe woodcrawling. If you found this series useful please share the link to this blog with others who might also like to travel or trek in wilderness areas.